THE LIGHTS ARE ON: Palmer Square is all umbrellas because of the rain. 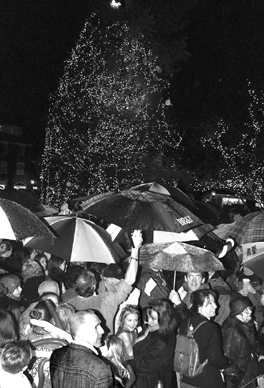 In spite of the inclement weather, many hardy souls turned out to watch as the Christmas lights were turned on. A health and safety draft plan related to the Princeton Regional Schools' construction was not available to the public at the School Board's meeting on Tuesday, November 25. The Princeton Township Committee approved an ordinance that moved to protect trees on both public and private properties. The general purpose of the "shade tree" code is to preserve the Township's tree canopy cover of 38 percent, and to prevent clear-cutting trees, which was described as cutting down more than 20 percent of the trees on a single property. New science books, reference materials, and the library's book club selections, along with more children's books, best-sellers, and audiobooks will be part of the Princeton Public Library's collection thanks to a $50,000 donation from the Friends of the Princeton Public Library.